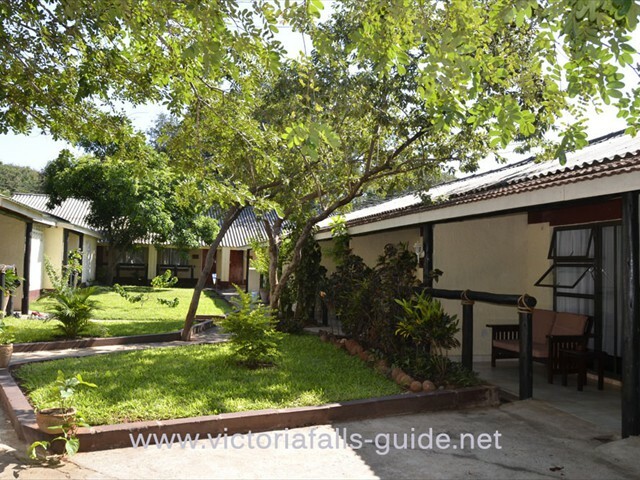 First opened in the early 90’s and then renovated in 2013, Pamusha Lodge is an owner run bed and breakfast lodge, located in the quiet residential area in Victoria Falls, about 3.4kms from the largest waterfall itself. Getting around town from the lodge is made easy by the 24-hour shuttle service for which they charge a small fee. From the entrance, the lodge is enclosed with a solid wall all around and large leafy Teak trees that give the feeling of being in a private and secure setting. Pamusha means “at home” in the local Shona language (see Zimbabwe Culture), and the structure of the lodge reflects the African ideal of being at home, with communal dining, drinking and socialising in the main area of the lodge. 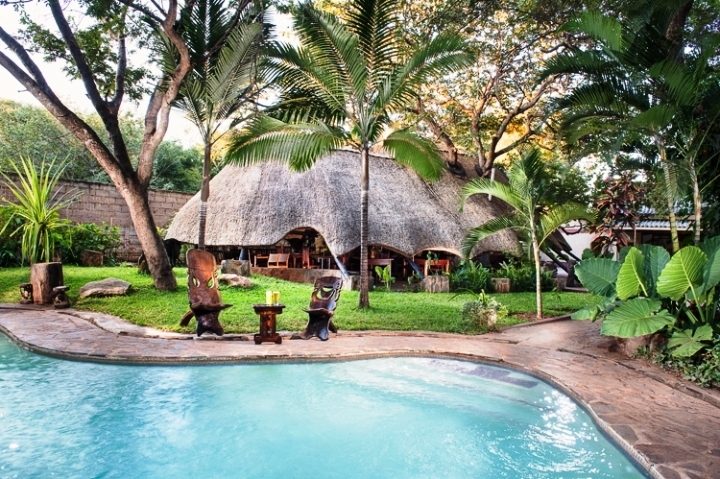 Set away from most of the rooms, the main area is cosy and well shaded in a lush green garden, with a swimming pool, a thatched dining area and fire pit. 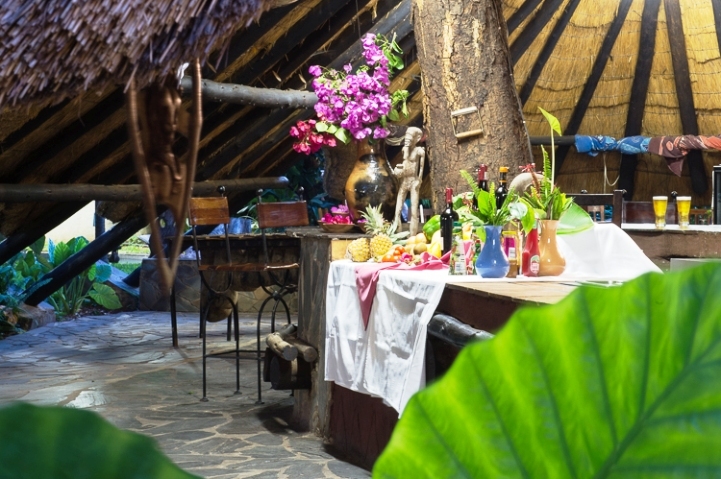 All meals are served under the gazebo, and at dinner guests have a choice of a full buffet or a la carte menu with traditional Zimbabwean options. Their complimentary tea and coffee station is open for guests, and drinks are served anywhere in the central area. The rooms at Pamusha Lodge have a simple and clean design with white linens and bursts of colour from the throw covers and curtains. The bathrooms are en-suite comprising a built-in shower with hinged glass doors, a wash-basin and flush toilet. Although the rooms aren’t very spacious, they are quite comfortable with over-head fans, air conditioning and TV's in each. 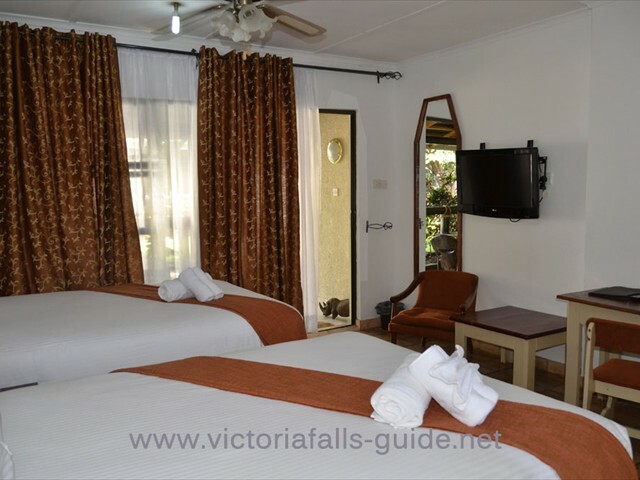 Staying at this lodge is ideal for those who aren’t looking for anything fancy, but want to have a nice comfortable stay in Victoria Falls with friends or family. Single and double/twin room options are available, but for groups of friends who want to stay close to each other, inter-leading rooms are also an alternative. Family rooms with a queen size bed and bunk bed are an ideal option for families of up to four with young children. Otherwise, families can also opt for the inter-leading rooms. 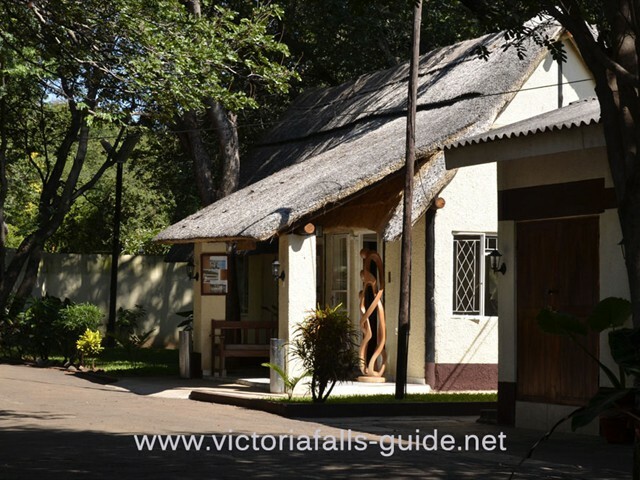 In our opinion, the lodge is in a good location, and the fact that they provide cheap transport into town and the Victoria Falls and have affordable rates, makes a stay at Pamusha Lodge worthwhile and stress-free. Children are welcome and family rooms are available at Pamusha Lodge. The lodge does not provide a complimentary shuttle service from Victoria Falls Airport, but transport arrangements can be made from Victoria Falls, Livingstone or Kasane airports. Contact us for more information.